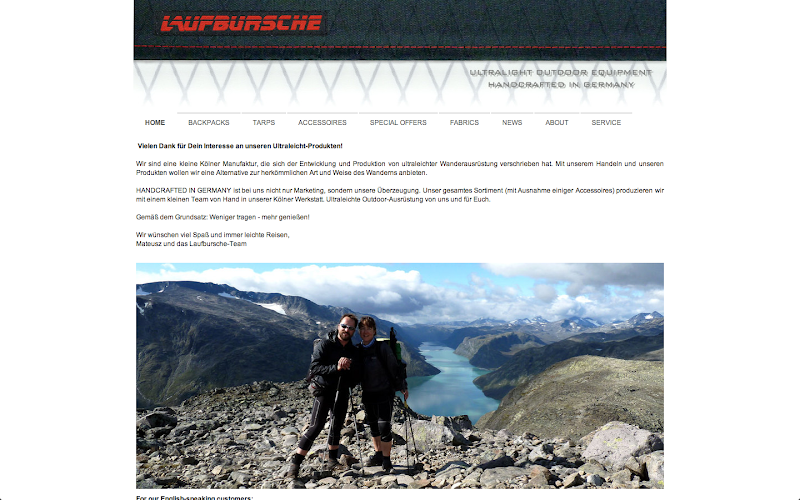 LAUFBURSCHE, as many of you know, has been for a long time working behind the scenes on offering their gear commercially through a webshop. To open a cottage gear business in Germany is not as easy as it is in other parts of the world, and Mateusz has been working on it since we first meet in the winter of 2010, when we sat around a fire talking about a his creations and how a webshop would allow people across the globe to purchase his meticulously crafted backpacks, tarps and other innovative gear. It is thus with much pleasure that I tell you that the LAUFBURSCHE webshop opens today, where you can purchase some of the best ultralight backpacks, Handcrafted in Cologne, Germany: The huckePACK, the huckePÄCKchen and the gorgeous Special Edition for the opening of the shop, a white XPac huckePÄCKchen! The shelves are filled with dozens of packs, so there is no waiting time - order today and have your backpack at home after Eastern! Custom packs are no problem either, here you'll be able to get a 'PACK made by Mateusz which is exactly like you want it - maybe a orange pack with a green lid? Or one made from Cuben? No problem at all. Also check out the fine accessoires including the beloved hipbelt pockets, ultralight & fluorescent Dyneema cords, Ti-Pegs and cuben packsacks. You know you need some! LAUFBURSCHE has a full pipeline of exciting gear coming out throughout the spring and summer, thus add laufbursche-gear.de to your bookmarks, subscribe to their Newsletter to not miss on out exclusive gear, deals and announcements and take a look at their blog to stay in touch with Germany's first UL cottage! From me a big congratulations to Mateusz and the LAUFBURSCHE Team for opening the shop!